The second round of Greek presidential elections once again failed to secure the 200 votes needed in a special parliamentary vote on Tuesday, thus bringing Greece one step closer to snap elections. The Greek presidential election has also attracted the attention of the international media and there were many known media giants that flocked outside the Greek parliament to cover the second round of voting. At the voting, only 168 out of a total of 300 MPs voted in favour of Stavros Dimas, while 131 voted "Present" (one MP was not present). In the first round held on December 17th, only 160 MPs voted "Yes" while 135 voted "Present" and five were reported to have been absent. The third and last effort to clinch 180 votes will be held on December 29th, but if Stavros Dimas doesn't win the confidence of Greek lawmakers, then the Greek government will be forced to dissolve and call for early elections (rumored for the last week of January or first week of February). 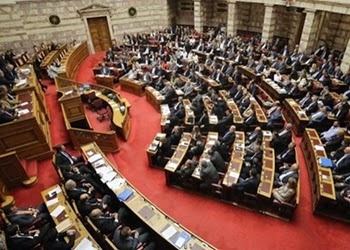 Following the vote on Tuesday, Greek Prime Minister Antonis Samaras stated that during the third round of the presidential election MPs will have to face the consequences of their actions if a president is not elected. "Every lawmaker will come face to face with the agony of the Greek people in the third round of voting for President of the Republic," Samaras told reporters. "Despite any differences and the mud wars by the team of Tsipras and Kammenos, more lawmakers voted for Stavros Dimas. I hope in the third round we will avoid a national threat. There (in the third round) there will be no 'present'; it will be a vote attached to a name and surname," he added, referring to the "Present" vote which essentially means "No" in the procedure. Samaras noted that MPs are responsible "for the consequences of their actions, the stability, normality and future of the country." On his part, the leader of the radical left main opposition party SYRIZA Alexis Tsipras argued that “neither Parliament, nor the people will give Mr. Samaras a blank check to continue the bailouts. The new year will find us having turned a page, with Democracy and popular mandate”. Whereas, the leader of the Independent Greeks party (ANEL) Panos Kammenos pointed out that hope was on the way, stressing that his party remained upright. And finally the leader of DIMAR (the Democratic Left) Fotis Kouvelis said that his party voted against Stavros Dimas in order to end the current government’s policies.